Here are general rules for both backyard and mobile smokers and grills. Since we make hundreds of models you’ll have to choose the instructions that match your features. If you have additional question please give us a call. The only dumb question is the one you don’t ask. Keep your grill or smoker at least 10 feet away from your house. Farther is even better. This includes portions attached to your house like carports, garages and porches. Grills should not be used underneath wooden overhangs either, as the fire could flare up into the structure above. This applies to both charcoal and gas grills. Keep decorations away from your grill. Decorations like hanging baskets, pillows and umbrellas look pretty AND provide fuel for a fire. To make matters worse, today’s décor is mostly made of artificial fibers that burn fast and hot, making this tip even more important. Read the manual! Follow all the safety restrictions to the letter. 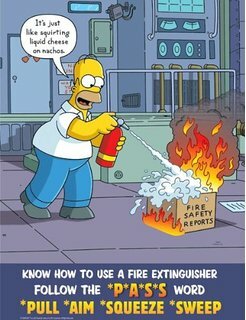 If you have a fire and you didn’t follow the instructions it is your fault, no matter what. Grills, gas or charcoal, and smokers all have very specific ranges of operation. You need to know these before you light up. Pay Attention– Grilling and smoking require clear thinking and focus, use common sense. Protect Others – The cooking area is not a play area. Keep children, pets, and friends that act like children and pets at least 3 feet from your cooking area. As the cook you are responsible for a lot more than the food. When you combine fire, friends, and sometimes alcohol it is easy to loose focus. Grilling and smoking require some clear thinking, be sure to use common sense and save the drinking for after the fire is out and someone else is dealing with the dishes. 1. You have just invited the most destructive force in the universe (FIRE) to your backyard BBQ. Are you a Pyro or Pit Master? Be sure you have cleaned your pit. Even in an off-set smoker the fire can ignite grease left in your main chamber. If this happens shut all vents, doors and dampers to cut off the oxygen supply and wait for the fire to extinguish before opening the door. You need to know your equipment, your fire and how to control the fire. Never leave a fire unattended. Fires double in size every minute. Plan ahead, have your other food prep chores done so you can focus on cooking. 2. So your a Barbecue Purest. 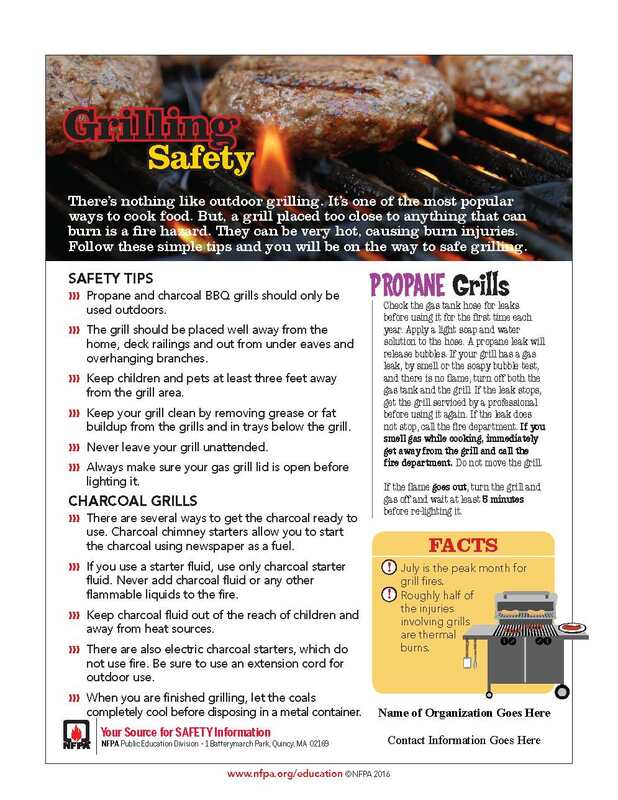 Be Safe when lighting your Charcoal grill or Smoker. Never use lighter fluid. There are many alternatives for lighting wood and charcoal. Never make lighting the fire a game. Never transport light coals if it can be avoided. 3.If your equipment has propane – Be sure you have done the maintenance! This applies to backyard and Mobile trailers equipped with Propane. The number one cause of gas grill fires is an obstruction in the path of the fuel. This largely takes place, behind, underneath or inside your grill where you do not look. While the top rated natural gas grills shouldn’t do this, it’s important to check anyway. There’s more of a risk if you have a cheap grill. This means you need to regularly inspect your gas grill for problems. Bugs and other critters can climb into little places causing gas to flow where it shouldn’t. You can make sure no gas is leaking from your gas grill by making a solution of half liquid dish soap and half water and rubbing it on the hoses and connections. Then, turn the gas on (with the grill lid open.) If the soap forms large bubbles, that’s a sign that the hoses have tiny holes or that the connections are not tight enough. Clean and perform general maintenance on the grill at least twice a year. Watch for rust, paint the LP cylinder to make it more rustproof, and check the regulator, hoses, burner parts, air shutter, and venturi/valve section carefully. Always turn off gas at the source (tank or supply line) prior to inspecting parts. Check owner’s manual for any additional maintenance requirements. Never turn on the gas while your grill lid is closed. It causes gas to build up inside your grill, and when you do light it and open it, a fireball can explode in your face. If a burner doesn’t ignite, turn off the gas. Keep all lids, doors and vents open and wait five minutes before trying to light it again. If the burners go out during operation, turn all gas valves to OFF. Open the lid and wait five minutes before attempting to relight, using lighting instructions. 4. Mobile Smoker Trailer Maintenance. Brakes – The average lifespan for a set of drum brakes is approximately a year and a half. When you replace drum brakes, it’s cost effective to replace the whole backing plate assembly, which includes shoes, hardware and wheel cylinders. Bearings – We use cone and cup bearings, you will need to pull them apart at least once a year and clean, inspect and repack them with fresh grease. Synthetic is better, but at least be sure you get wheel bearing grease, which is formulated to withstand the heat generated by rotation. Electrical – Every time you use the trailer check to see if all your lights are working. With the trailer hooked to your truck, turn the lights on. Walk around to the trailer to see if the running and clearance lights are working. Then, have someone step on the brake pedal and actuate the turn signals to see that they work. As you can see, much of the maintenance involved in electrical systems is a mere matter of inspecting them. Also, be sure to inspect the rubber grommets where wiring enters and exits the frame. If they’ve fallen out or rotted away, your wires can chafe and ground out.When maintaining you trailer, take some time to follow the wires on your trailer Keep an eye out for corroded, worn or cracked spots. If you come across any weak points in the wiring, wrap it several times with electrical tape to insulate it. Tires – Keep your trailer tires well maintained. In many cases, especially with large trailers, the added weight the tires support even when stationary can cause trailer tires to wear out significantly faster than the tires on truck.If your trailer’s been sitting around unused for a while, it’s a good bet the tires could use inflating. Using your trailer often can obviously lead to loss of air pressure, but tires also lose pressure when not in use. All tires leak air over time, and so keeping an eye on your air pressure is essential to keeping your trailer properly maintained. General Towing GuidelinesWhen towing a BBQ trailer, forget about being in a hurry. Leave plenty of travel time because some states have decreased speed limits that dictate how fast you can drive with a trailer in tow. Even without lower mandated speed limits, other drivers will be riding beside you to check out the pit and stopping for fuel will take an extra 10 minutes to show it off. Allow for plenty of travel time.In fact, towing a trailer requires just a little more of everything. You’ll need extra distance to bring your vehicle and trailer to a stop, and so it is very important to always leave extra room between you and the vehicle in front of you – far more than if you were not towing. It has as much to do with safety, good driving manners and collision avoidance as it does with braking performance. When towing, the vehicle’s brakes develop more heat than when you are not towing. An increase in heat can lead to diminished braking performance. By leaving a lot more room between you and the car in front of you, and by looking as far ahead as possible when you drive, you can avoid heavy braking.